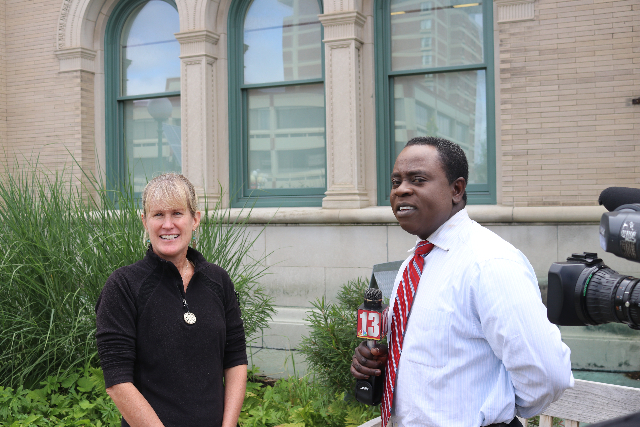 Board president Elizibeth "Buzz" Hayes McGraw speaks to a TV crew from Albany. 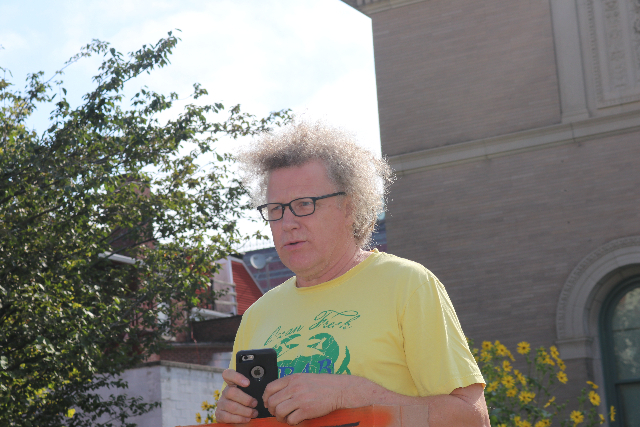 Artist, activist and organizer, Peter Dudek. 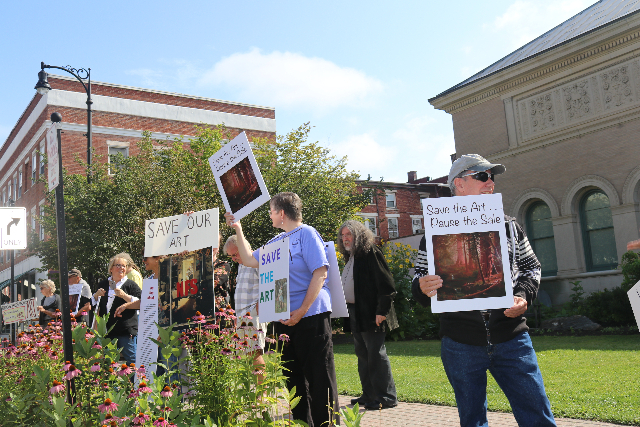 Museum director, Eric Rudd, of North Adams joined the demonstration. 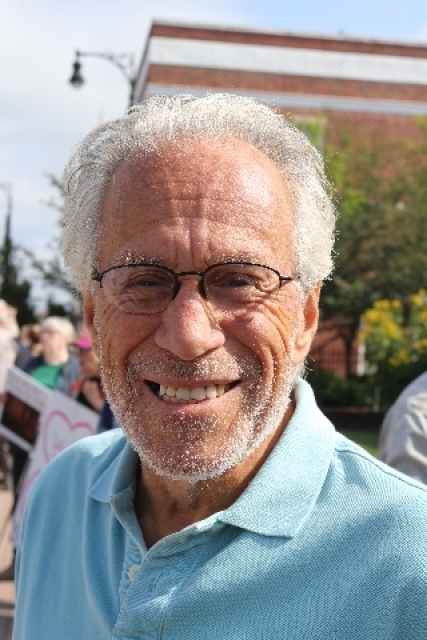 Grier Horner artist and former Berkshire Eagle writer. Passing cars honked their support. 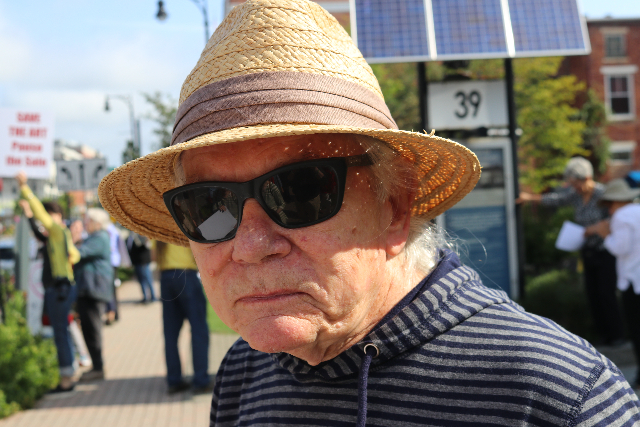 Wired West activist Steve Nelson. Artist and arts patron Jonas Diyvedenas shared insights. Caught on camera by Jonas. 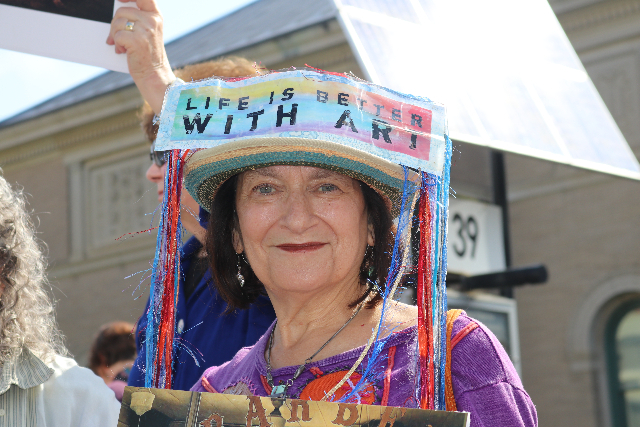 Astrid Hiemer showed her support for demonstrators. Enjoying a donut during the protest. It looked like rain when Astrid and I drove to Pittsfield on Saturday morning. But the sky was clearing and there was a break in the weather. Arriving just after the announced 9 AM to 12 PM demonstration it was heartening to see a line of protestors with a variety of handmade signs along the sidewalk of the Berkshire Museum. We interacted with Peter Dudek, an artist and arts administrator. 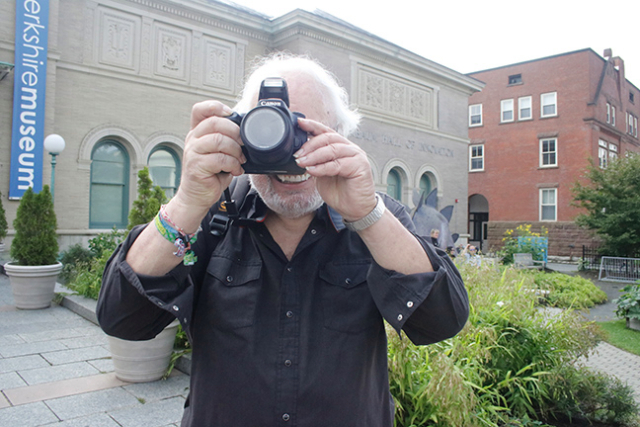 For a time he was director of Storefront Artists Project which was an early effort to jumpstart moribund Pittsfield through the arts. Other elements of that ever expanding revitalization was the now thriving Barrington Stage Company which now owns several buildings. Largely funded by GE Cleanup funds the magnificent Colonial Theatre, next to the museum, has been renovated and is now a part of Berkshire Theatre Group. When we first bought a Berkshire home in 2001 the storefronts along North Street were vacant or had SAP’s popup galleries. Now a centerpiece is Hotel on North with boutique rooms above a large restaurant. 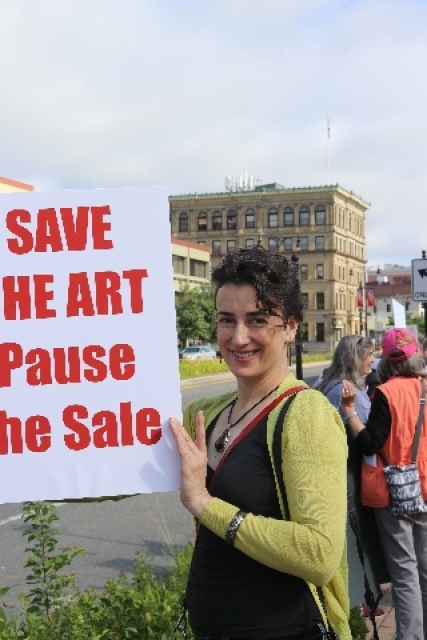 In this rising tide business in Pittsfield is afloat with the exception of the Berkshire Museum, which for the past six years of mismanagement by its director, Van Shields, and an ineffective board of directors, more recently chaired Each of the artworks the Berkshire Museum plans to sell were “unrestricted and unencumbered” gifts, according to museum leadership. 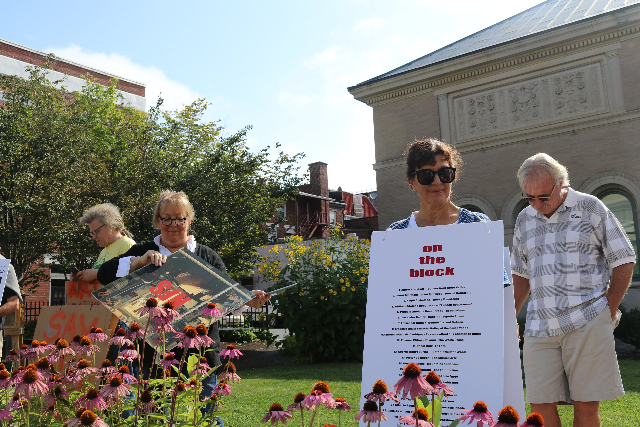 Instead of putting the museum back on an even keel the museum’s 22 member board has signed off on the literal destruction of a museum with a legacy of 114 years of serving the Berkshires. That entails the sale of 40 cherry picked works from its fine arts collection. With a projected $60 million from the sale and additional fund raising it hopes to retire some $10 million plus of deficit, apply $40 million to endowment, and spend some $20 million on renovation entailing gutting the historic art deco, Crane Room, an architectural treasure on a par with the works being sold. Ripping out the historical integrity of the museum, as well as its auditorium with iconic mobiles by Alexander Calder, to create a large lobby and soaring atrium is destructive and crass. Experts who have viewed the lobby and plans comment that they are generic and unimaginative. The result of destroying historical heritage is to create a lobby rather like those of most commercial hotels. There have been many museum renovations and expansions and the guiding concept is to do no harm. The prevailing approach is to add new wings then upgrade and refresh the historical structure and galleries. This has been the approach of the Museum of Fine Arts, Clark Art Institute, plans for the Hood Museum of Dartmouth College, and the Library of the British Museum to mention just a few but prominent examples. The area in front of the Berkshire Museum is more than adequate to create a dramatic atrium for the museum while leaving intact the museum behind it. The approach would be to then refresh and renovate the galleries, offices and storage areas. This would likely cost far less than the proposed $20 million. It is also likely to have more curb appeal and drive by wow factor than the current inept and amateurish thinking. The heart of the matter is that from day one Shields has demonstrated no interest in or commitment to the fine arts. That know nothing approach is echoed by his co-conspirator McGraw. Prior to joining the board there is no indication of prior knowledge of museum administration. 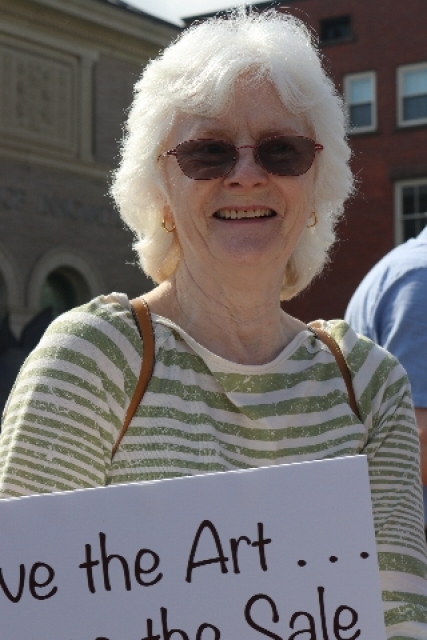 Her husband, Robin McGrawn, serves on the board of trustees of Volunteers in Medicine, Berkshire Healthcare Systems, HospiceCare in the Berkshires, Mystic (Conn.) Seaport Museum and the National Multiple Sclerosis Society that inducted him into its Volunteer Hall of Fame in 2015. 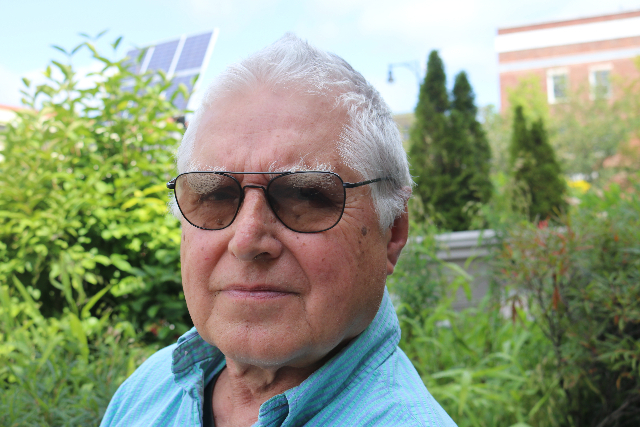 Most recently, he has brought his energy and commitment to addressing the Berkshire County drug epidemic through his work with the Berkshire County sheriff's opioid task force. We have spoken at length with numerous artists, arts leaders, and philanthropists who report having been blown off by Shields. Some have speculated that on day one he had the current plans in place and moved forward by putting in place that board that would support his position. Some $60 million is quite a pot of gold at the end of the rainbow. This is accomplished with the speed of an auction hammer compared to the 20 plus years it took for Joe Thompson to squeeze $65 million in tax payer dollars to renovate and create MASS MoCA. He raised about double that amount in matching grants. Looking down the block Dudek spotted an approaching dad with his son perched on his shoulders. “That makes 40” he said to me. I asked if he counted the kid? It was then about 9:30AM. There was steady ebb and flow until noon when museum security abruptly escorted protestors from the front of the property. At any given time during the peaceful and orderly event there were between 40 and 80 people. As cars passed the signs were waved. 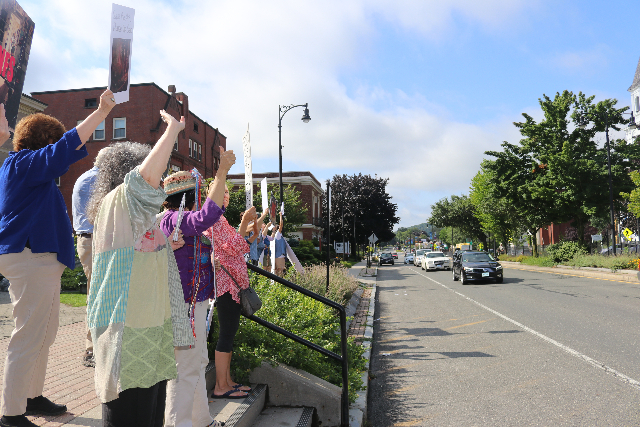 When many passing vehicles, including a fire truck, honked in support there were cheers. There were no counter demonstrators that attended the widely publicized event. Ignoring the picket line a number of families with children entered the museum. There seemed to be few if any single adults or couples. There was no interference with individuals entering the museum. Personnel and security from the museum kept watch on the demonstrators. 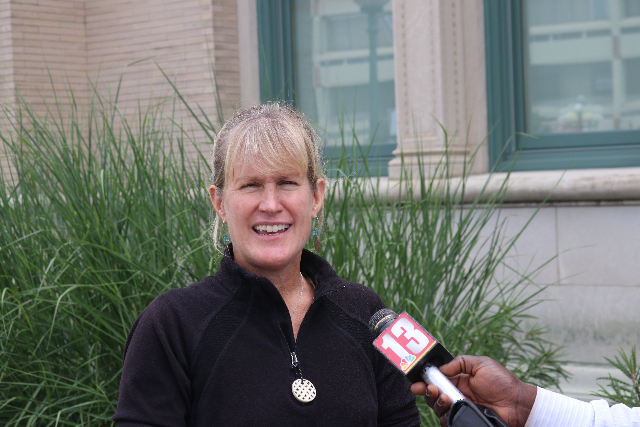 Members of the media including TV crews interviewed protestors, as well as museum representative McGraw. She appeared to be nervous on camera and objected to being photographed. It appeared that she was not used to the ground rules for media coverage. From what we later saw of brief TV clip it reiterated her usual boilerplate remarks. In essence she stated the false stance that nobody has come forward with viable plans and alternatives. There has been lively discussion in the media as well as privately which Shields and McGraw refuse to acknowledge or respond to. As they have commented to the Berkshire Eagle. "You can overlay the stages of grief with all of this," McGraw said. "[The public] haven't processed this fully. We need to help them get through their anger. The board has processed it. We are on the other side of it." "This is not easy. I love these works of art," Shields said. "We are very excited about what we are doing. But we totally understand why some people are not." “We are not a sliver,” Leslie Ferrin says. The group has swelled beyond 1,100. While far from providing the transparency demanded in the Eagle editorial it appears the museum is responding with increments. 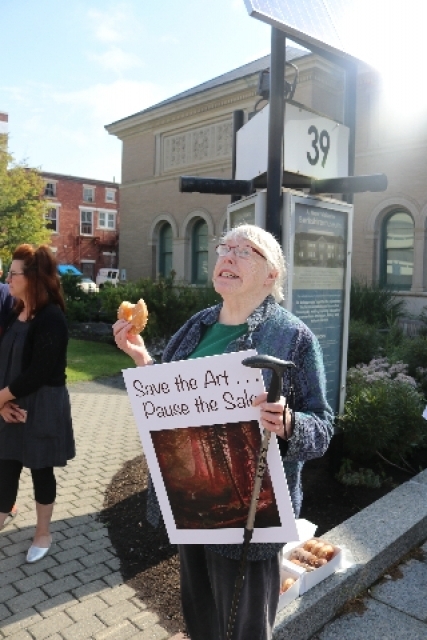 Carrie Saldo will file a report on museum finances this week we were told. As to the Shields statement, to paraphrase our President, the museum is locked and loaded in its contract with Sotheby’s. In the case of the two works by Norman Rockwell, and based on a published letter stating the protest of three Rockwell sons and several grandsons, that remains a possibility. “Stuart Henry(director of the Berkshire Museum) was exhibits chairman of The Corner House, a community gathering space that would eventually become a museum dedicated to Rockwell’s work. In a May 21, 1969, letter to Henry, Rockwell discusses the opening of The Corner House, which was to include a display of Rockwell’s paintings. “The “Fred” referenced in the letter is Fred Holden, who worked as a courier for Rockwell. In this instance, Holden would have likely brought items from Berkshire Museum storage to The Corner House for Henry’s use, Norton Moffat said. “She pointed out Rockwell donated his works, through an irrevocable trust, to The Corner House with the understanding that the collection remain together and available to the public forever. 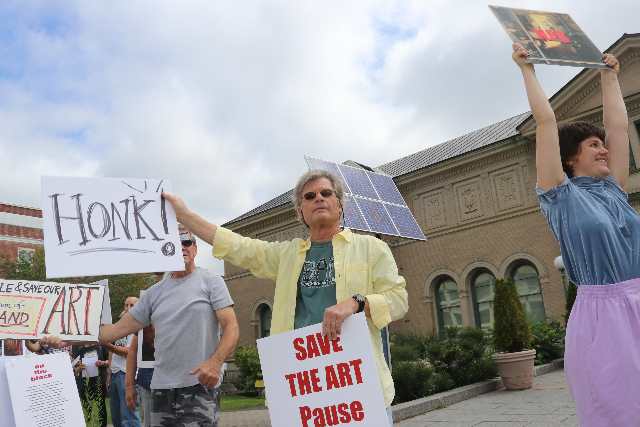 “According to the trust, if The Corner House ever disbanded the entire Rockwell collection was to be given to the Berkshire Museum, Norton Moffatt said. 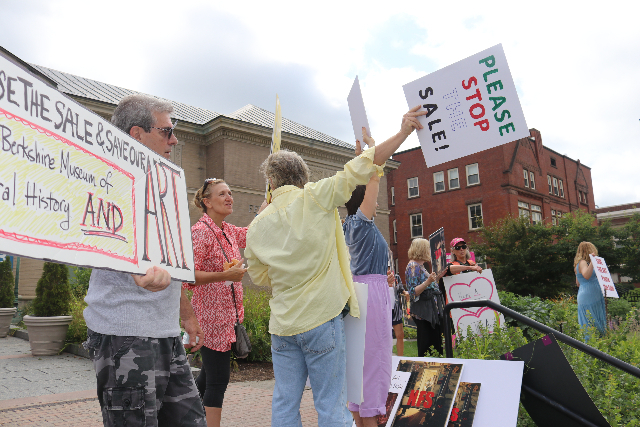 In other coverage the Eagle reported that “Each of the artworks the Berkshire Museum plans to sell were “unrestricted and unencumbered” gifts, according to museum leadership. Not true. Consider, for example, some points raised by Sally White of Williamstown. These are typical of the legitimate issues that Shields and McGraw refuse to respond to. Once they have succeeded in ripping out the heart and soul of the museum she is typical of the informed members of the community it will have to win back. 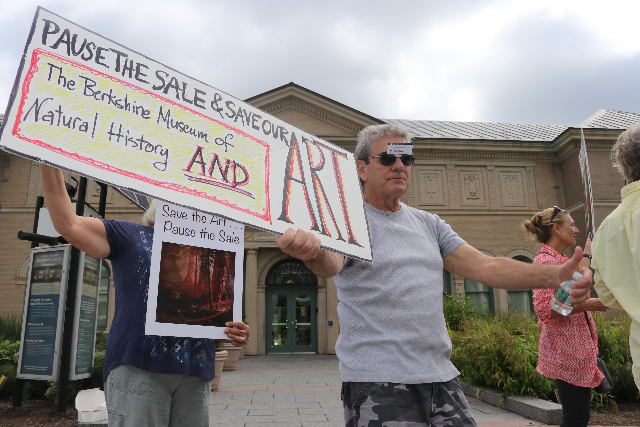 “Has the Berkshire Museum held a capital campaign to raise money? “If so, who are its chairmen? “How much has it raised? “Has it offered naming rights to wealthy individuals or companies to sponsor rooms full of art? Was this its first step in trying to keep the art at the museum? Did it ever take any steps to keep the art before deciding to sell it? “What is the museum’s future mission? Will it retain the Feigenbaum Exhibit in perpetuity, the first floor nature exhibit, the rented summer exhibits on the second floor, or does it have a specific grand plan for its future? If so, what is it? “Why has this process been made public so swiftly? Today’s paper tells us that the artwork has already left Berkshire County. 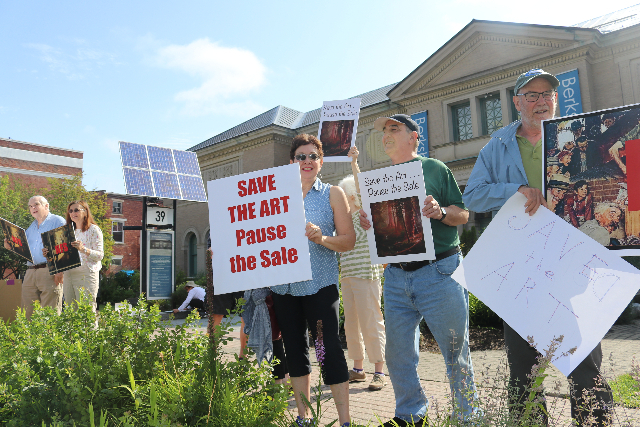 Whatever public and professional opposition to the sale has come too late, and one can’t help but surmise that this was part of the museum’s plan. "The imperious behavior of the Museum raises many red flags. The Museum Administration's smug dismissal of the of the protesters' complaints on the basis that the protestors did not provide any viable fiscal solution to the projected financial problems is specious in the very least. The protesters did not cause the problem, and this is not the time to require them to solve problems that are uniquely of the administration's making. There is a wide spread consensus that collections are not to be treated is as cavalier a manner as we see here. There are over arching questions that need to be considered. One is: what would it cost the Berkshire Museum to acquire the works it intends to sell, if it were to attempt to obtain those same objects today? The other is: what would it cost the Berkshire Museum to re-acquire those same works, once they had been sold off? We have seen the likes of Thomas Hoving cheapening the role of the Museum over these past few decades, while simultaneously driving up the costs of running such institutions. The present fate of the Metropolitan Museum is the result of such hucksterism, as is that of the Berkshire Museum The Berkshire Museum, as many others have dumbed down their presentation to the point of stultification, in an attempt to appeal to the lowest common denominators; and all have reached similar dead ends. 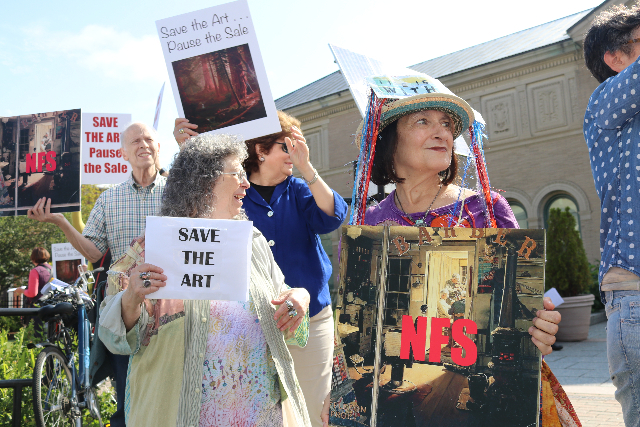 In light of the present situation, no amount of money could ever rescue the Berkshire Museum from Intellectual, Aesthetic, Moral and Civic Bankruptcy. Edmund Rucinski"
"So from what I understand the art work has been delivered to Sotheby’s. .Now let me fill you in on the Auction biz ...The Auction house has been commission to sell the art work ..Once they take possionion of the art work it now falls under there control untill auction time ..Now if you like the Auction House to give them back that easy...You pay the Auction House for the Pick Up shipping and Professional Packing of the art work . Then you reimburse them for there time in Cataloging ,Photographing and Catalog printing ..Then you pay them for there lose of income on an estimate of what the Sale would of generated plus Commission . Now you see how easy it is just come up with about 25 Million." "Yes, your interest and coverage have brought the museum issue to a larger public, and added to the public good. As for museum aesthetics, anyone familiar with the Brooklyn Museum before and after will know how runaway and run-amuck make overs and design enthusiasms can forever spoil a good thing. Yet in the spite of the horrid new front exterior, that museum as an art establishment is better than ever. I don't think they sold off the art to cover the exterior. How did they raise the dough? 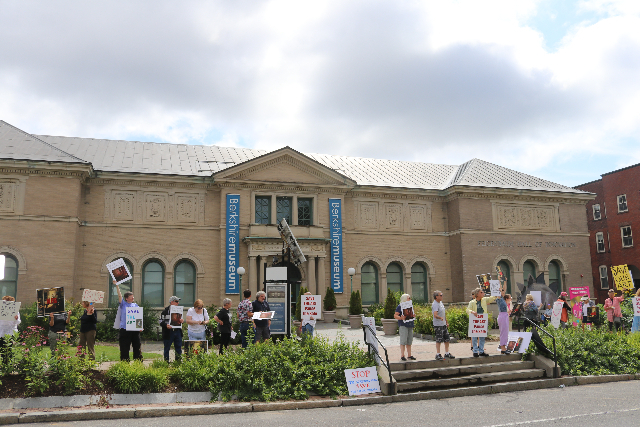 Shame on Berkshire Museum!" "The group letter had over 50 signatures and the group is over 1100 after one month." "I'm despondent over this horrific plan. I grew up in Lenox but live in Africa now and am despondent I missed seeing some of my favorite paintings at the Berkshire Museum before they were scuttled off without warning. I will miss showing my daughter the museum as it was when I was young and introduce her to fine art and architecture. What a shame. They have ruined a fine institution. I'm so mad." "This is a sad affair. Perhaps the board, if unwilling to raise funds in the way all museums have to, should resign ( along with its feckless director.) my feeling is it let should merge administratively with another educational non-profit in the region, and then begin the process of stabilization. It would be preferable to see the museum close for a few years of re-organization, then to forever destroy the core of its art irreplaceable collection." "Thanks Charles for the coverage, following this issue from the beginning and providing yet another service to our community."